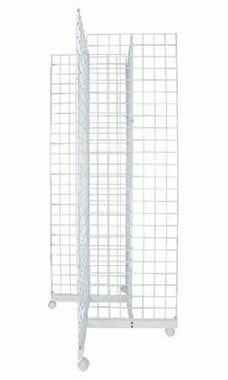 Drastically increase the amount of space you have available in your showroom with this 4-Way Grid Tower! This Tower unit includes 4 grid panels, connectors, and the base with casters. The base with wheels allows for easy mobility, which means you can change your displays regularly! The dimensions for this grid tower are 36'' x 36'' x 6½'H. All of the shelves and faceouts, and other accessories are all sold separately but can be purchased through Store Supply Warehouse. In stock and available for shipment immediately. Great grid and a total easy display.Using this at a mall to display our photo letter art.Easy to roll around.The only dislike is during installing grid to base, it would be nice for a center slot for the grid to lock into while connected both ends.